This rising Star Acrylic Award boast simplicity and fun while making a perfect option for that special star performer. An Exellent patriotic award. 4-1/4" x 5" x 3/4"
Our star awards are crafted out of clear acrylic, hand polished and feature smooth rounded corners. This product is a great award for any commemorative event. Available in three sizes. Laser cut Star acrylic shooting up from a custom colored and fluted base. Laser engrave this for a stunning incentive award. 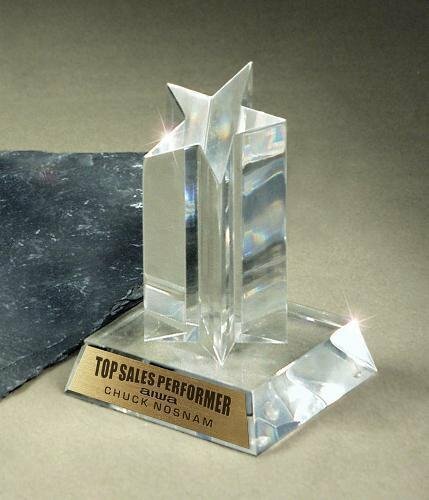 An Elegant Starburst Star Acrylic Award on Clear Base. Fully Laser and Rotary Engravable.